A few years ago, I painted some small quilt blocks to hang on the side of my mom's quilt shop, Quilters Cupboard, in Uxbridge, Ontario. Her shop is in a house, and it seemed that many people who were first time shoppers seemed to have trouble finding the place...even though it's right on the corner of an intersection, and a house with a parking lot beside it seems unusual...so mom thought that if we hung some quilt blocks on the exterior walls, it would help customers find a place. Fast forward to a couple months ago, when Renate from the Farmer's Wife Retreat House contacted me to do something similar for her barn at her quilting retreat house. This place is great! Grab a handful of friends who love to quilt, gab, and eat, and pile them all into a house prepped for quilting and cooking, and sleeping if there's time for that. Rent it out for the weekend, or even the whole week, and just create and laugh to your heart's content! It seemed though, that Renate was having some of the same troubles as my mom, and visitors were having some trouble figuring out which farm house was the right place for their retreat. Enter the 6 by 6 foot giant quilt block to hang up on the side of the barn. 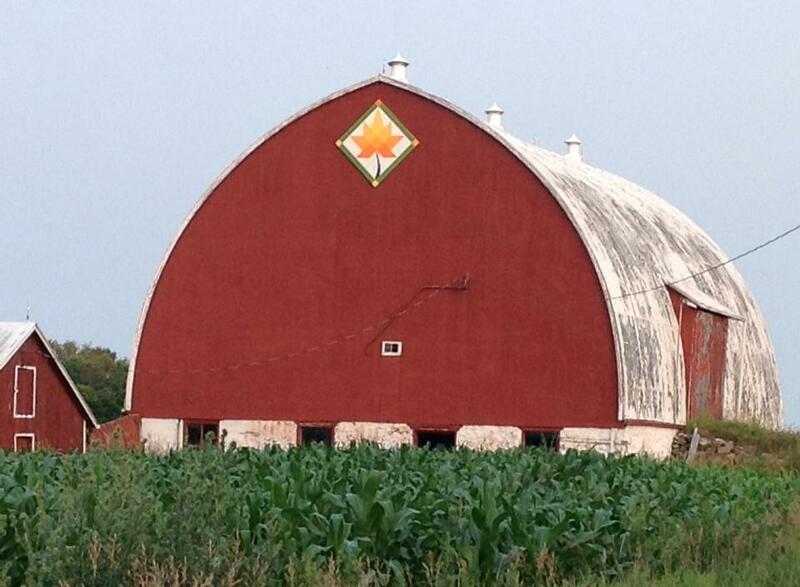 I think that it looks great up there against the red of the barn...but don't you think a couple more would just give it just a little more attention? Maybe that's just me, haha! Here's a close up shot of the piece. Newer PostPink and Gold Gold Gold!